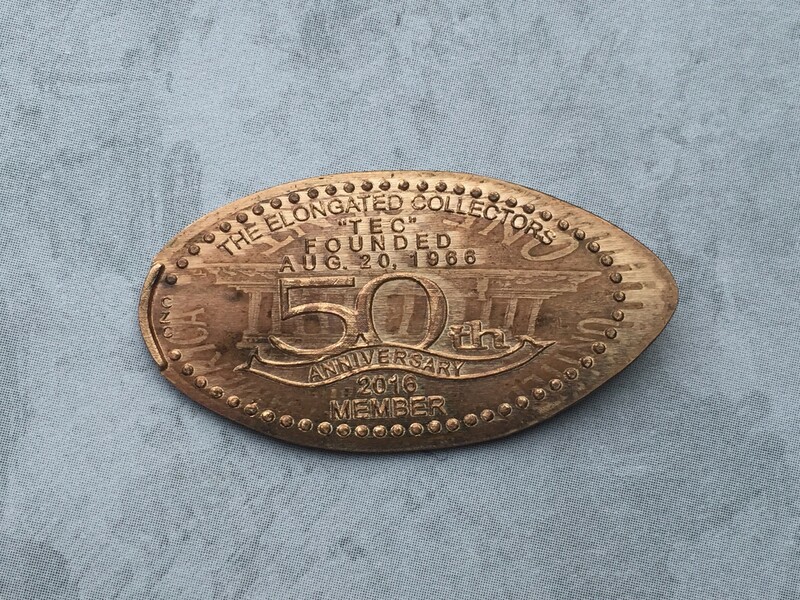 I’ve written about The Elongated Collectors (TEC) club numerous times in the past, but this is a special anniversary. TEC was founded back in 1966 which makes 2016 the 50th anniversary, and I must say is quite an achievement. I’ve been a member for 6 years or so and really wish I had found this club sooner. The members are a wealth of knowledge about elongated coins, and every aspect of the hobby. The above pictured pressed coin is our 2016 membership coin which I always look forward to getting. 1966 pennies were pressed as an added detailed representing the year the club was formed. These coins were donated by various TEC members who are always up for a challenge when it comes to the club. The design was created by Cindy Calhoun who I had the pleasure to meet a few years ago at the ANA Convention that was held in Philadelphia. These membership coins are only one of many that you get as part of your membership to TEC. There is a quarterly newsletter available in either a digital format or hard copy if you prefer. The membership fee is very affordable, and I feel well worth all the benefits of the club. Please make sure you take some time to visit TECNews.org to get more information about the club, and you can also sign up (or renew) your membership. Feel free to use my TEC # 4237 as a reference so they know who shared this great collecting tip. I really feel that my passion for the hobby has only grown stronger now that I know how many other people are just as obsessed. What are you waiting for go sign up now! !